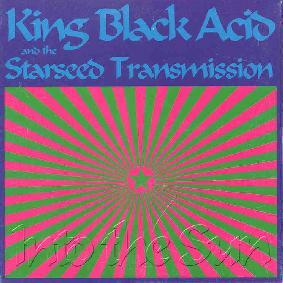 King Black Acid and the Starseed Transmission - "Into The Sun"
This 4-song CDEP features tracks from the soon to be released full-length CD and is the first recorded music to be released by King Black Acid since 1997's "Royal Subjects". Having evolved from The Womb Star Orchestra to The Starseed Transmission, the band's sound is fundamentally intact. The main difference that jumps out at me is that the vocals are featured more prominently from a production standpoint giving the music more of a 'song' feel. In fact, only now do I realize what a passionate vocalist King Black Acid lead-man Daniel Riddle is. Still, the tripped out spacey King Black Acid sound is here in full force. The gorgeously floating and melodic space guitars that made the band's first three CD's so special are present, embellished by sparse keyboards and synths. The result is some wonderful music that will make you close your eyes and drift away. Though it's been a few years since we've seen a studio release, King Black Acid has been active playing shows in their home base of Portland, OR. Regular reports from Number One KBA fan ACTION MAN have kept us here at the AI offices most antsy for something new from the band. Can't wait for the full-length! You can visit King Black Acid at their web site.